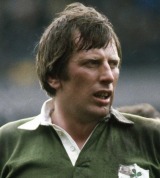 Keane won 51 caps for Ireland between 1974 and 1984, including their 1982 Triple Crown victory, and also gained a Test cap for the British & Irish Lions on tour to New Zealand in 1977. A second-row for Lansdowne and Munster, he also played in the Munster side that famously beat New Zealand 12-0 at Thomond Park in 1978. During his youth Keane had been a devotee of Gaelic football, starring for University College Cork and winning medals in the prestigious Sigerson Cup - the highest level of University competition. He died in October 2010 following a long battle against cancer.